For 16 inspiring years, we’ve been privileged to witness thousands of people transform their health with Isagenix. Our results prove that meal replacements are a great vehicle for weight loss , and can support long-term and sustainable health changes when part of a nutritionally-balanced meal plan. Many scientific studies demonstrate the benefits of shakes as a powerful tool for weight loss results, including an Australian research review that was conducted recently at the Royal Brisbane & Women’s Hospital in Brisbane (1). Research shows that when people start to see results soon after they start a weight loss program, they are more motivated to continue, and in turn more likely to stick to the program in the long term (3). Similar results were also observed from our clinical trials, where participants using the Isagenix system lost an average of 4.1 kg after 30 days, had more consistent weight loss week to week and were more likely to continue, compared to those on a traditional Heart Healthy diet (4). Combine this with the inspiration and support of the Isagenix community and there’s no stopping you! With the plethora of food and nutrition information available to us — high GI, low GI, GI load, good fats, bad fats, calories in, calories out, nutrient timing, protein pacing — is it any wonder that we get confused? Our 30-Day Weight Loss System makes it simple to eat well, because one or two meals are taken care of, so you have only one meal (and a light snack or two) to decide on. Once you’ve committed to starting an Isagenix System, we recommend you continue following a 30-day system until you have reached your initial weight loss goals. For some, this might be four weeks; for others, 16 weeks or beyond, depending on your health and weight goals. It’s no coincidence that the IsaBody Challenge® is a 16-week commitment; it’s intentionally designed to help most people achieve the results that they desire. After achieving your initial goal, we encourage you to find a maintenance protocol that best suits your preferences, lifestyle and long-term goals. This way, you’re able to use the shakes and bars when you need them (like replacing a meal the day after you’ve overindulged!) but still allows you the freedom and flexibility of enjoying all the foods you love and eating out with family and friends. In collaboration with Skidmore College and principal researcher Dr Paul Arciero, we invested in a clinical study to further validate the weight loss outcomes of 12 weeks on an Isagenix 30-day system, and the long-term sustainability of a maintenance protocol followed for a further 12 months. The findings were published in two esteemed, peer-reviewed journals — Nutrients and Frontiers in Physiology (5,6). During the initial 12-week weight-loss phase, subjects lost an average of 10 per cent of their total body weight, nearly 20 per cent body fat and 33 per cent of their visceral fat. They also increased their proportion of lean body mass (9 per cent) and had significantly improved cardiovascular health with improvements in arterial flexibility (11 per cent). Over the year-long weight maintenance period, the subjects who continued to follow an Isagenix System had a significantly lower body weight (6 per cent), lower amount of total body fat (10 per cent) and improved lean body mass (5 per cent) compared to those who followed a Heart-Healthy diet. The bottom line? 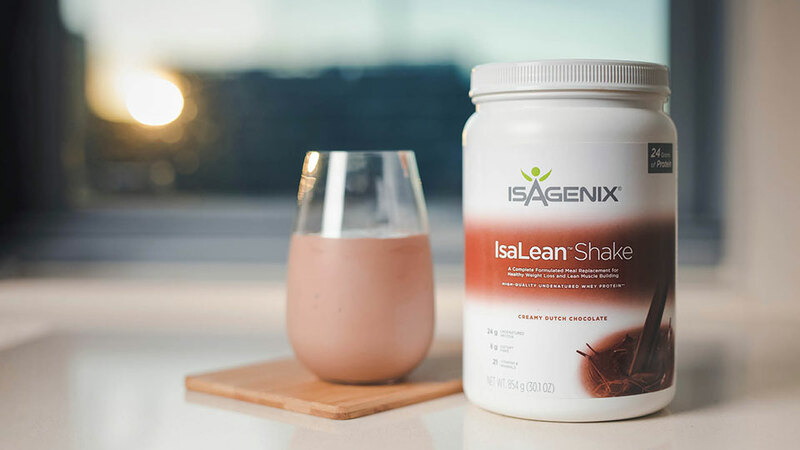 When used as part of a system combining Shake Days and Cleanse Days, Isagenix Shakes and support products improve body composition and contribute to good heart health during weight loss. They also offer better long-term weight maintenance compared to traditional (whole foods-based) diets. What’s not to love about using Shakes and Bars for weight loss success? Hansen S, Huttunen-Lenz M, Sluik D, et al. Demographic and Social-Cognitive Factors Associated with Weight Loss in Overweight, Pre-diabetic Participants of the PREVIEW Study. Int J Behav Med. 2018;25(6):682-692. Klempel MC, Kroeger CM, Bhutani S, Trepanowski J, Varady KA. Intermittent fasting combined with calorie restriction is effective for weight loss and cardio-protection in obese women. Nutrition Journal 2012; 11:98.